Wild blueberries, genus Vaccinium, collected in Colorado on hands and knees in early August around 9,000 feet. If you’re looking for blueberries like the kind you buy in the grocery store, look elsewhere. The Colorado high country “blueberries” I’m talking about are not those, but several related species of Vacciniums that are smaller, and grow not on a bush but in the groundcover under your feet in the high country. Whereas cultivated blueberries have round depressions surrounded by a crown, our small high country wild blueberries have a round stamp in the berry, but no crown. They can be red, maroon, dark blue, powder blue, purple-blue, to almost black, and they range from translucent to opaque. I generally refer to these high country blueberries as “huckleberries.” There are quite a few names that people use for the wild Vacciniums up here— grouseberries, whortleberries, bilberries, huckleberries, and blueberries among them. But just the other day as I was trying for maybe the hundredth time to disambiguate a couple of our local species (having not, on hand, a best friend who is a local botanist though I would appreciate one very much), I read in Weber & Wittmann’s Flora of Colorado (2012 ed.) 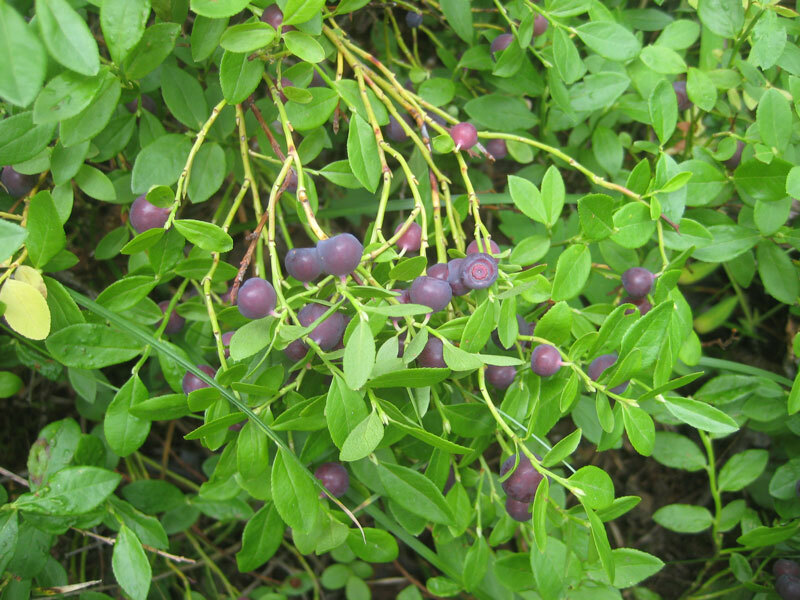 that it is not correct to call them huckleberries, and that “blueberry” is the correct common name. So I thought I’d try that name for this post and see how it felt. Guess what’s under all that lush ground-cover? It’s huckleberries, I mean blueberries, I mean bilberries, I mean grouseberries. I know of at least three distinct species of Vacciniums up here—the small, red Vaccinium scoparium; a powder-blue-berried, fat oval-leaved, very-low-lying species that grows high up in the hills at and above treeline; and the common ones I found yesterday. Confusing matters, they can interbreed. I’d been scouting a trail that was new to me in the East Vail area in the hopes of spotting mushrooms, but when I found myself in a forest carpeted with low plants bearing small, oval-shaped, pointed leaves, I knew to bend down and glint sideways at them to see if there were any plump, round, gems hanging underneath. Sure enough, I found a ripe berry! Then I found 10 berries. Then I found 100 berries, high up in a beautiful spot at the base of a sun-dappled, conifer-covered hill by the creek, after a good solo hike. I spent a while there gathering half a Cool Whip container full, listening to Nature. Good patches can be quite fruitful, but the berries are nonetheless time-consuming, and labor-intensive, to gather. They were so plentiful I hardly made a dent in the berry population there, which I’m sure the bears will appreciate. I didn’t see any Boletus edulis on my hike, but I did find a couple fly agaric buttons, which grow into the red-and-white Amanita muscaria “toadstools” of stories. They were still in their cracked yellowy button form, pushing their funny way up through the duff. Then I found 10,000 berries. When the plants are this thick with berries, one hand gently rakes and the other catches. At least, that’s how I do it. It was not until the way back down that I came to the land of 10,000 blueberries, closer to the trailhead and human activity, in a zone of mixed aspen and conifer. I couldn’t believe how many berries draped each small plant, double or triple my good find up high. When they’re like that you can gather them by gently raking the plant with one hand, holding the other underneath to catch them, and then transferring berries a handful at a time into a collecting container. I spent another 30 minutes or so in this patch until my back started hurting from bending over for so long. I managed to get one container full. Not a lot, but enough to share with Gregg and Butter. They really are precious. (The berries, I mean, as well as Gregg and Butter.) And now I know of another a good patch. Gregg was surprised and delighted to see the berries. First, he jumped up off the couch and whipped up some shortbread cookies with them. The cookies were very tasty, although the leftovers were no longer crumbly by morning due to the moisture in the berries, so Gregg is going to have to tweak the recipe a little. Still, it was a fabulous treat, especially hot out of the oven. The next night, I cleaned the remaining berries of leaves, hard, white, undeveloped berries, and small woody matter and divided them into two jars. “Here are some cleaned huckleberries,” I told Gregg. “Do you want to do something with them? Or should I sprinkle sugar on them and let them macerate?” He ended up eating half the jar with a fork. I’m not complaining. I’m glad there’s a way to get fruit into this notorious fruit-hater. I tell you, Colorado’s huckleberries are divine. Oops, I mean blueberries. Or maybe I’ll start calling them bilberries. Aw, but huckleberry is really so much more fun to say. Have you seen the translucent ones? Every time I try sit down with this genus and a flora, I just end up in a big mind bend, and eventually settle with just happily eating them. Maybe in a few more years I’ll get them sorted. Thank you for the treasure, btw. Holy schmoly, that flavor just never gets old. I’m voting for bilberries, but huckleberry is the best. Nice haul! Here in the north east I pick wild blueberries. High and low brush. This year was exceptional. I was able to freeze quite a bit. 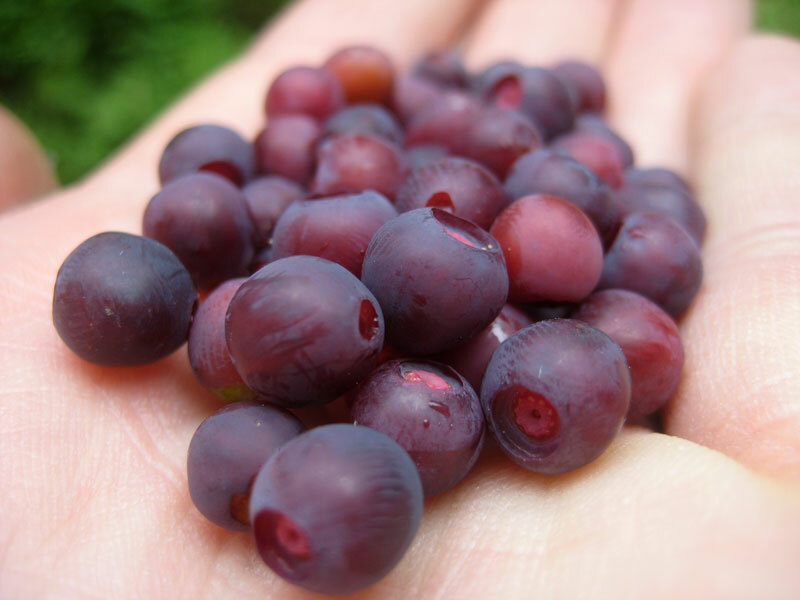 Looking to forage some wild cranberries in the fall.Thanks for the great post. I’m so eager to find some of these blueberries, or whatever. First time visitor to your blog and I’ll surely bookmark it. Is it inappropriate to ask where I could find some of these, preferably off route 24? If you could give me a hint of a trail, I’ll be there tomorrow! They’re by far the best tasting berry in Colorado. I picked a bunch yesterday and plan to make jam with them.